How to play Sudoku ? A "Sudoku" has only one unique solution. The number of already filled places varies and ranges typically between 20 and 38 out of the 81 possibilities. The "Sudoku Generator" provides you a random Sudoku puzzle with givens in the range from 22 up to 31 numbers. You can choose between four difficulty levels - "Very Easy", "Easy", "Moderate" or "Difficult". The "Sudoku Solver" gives you the solution to any Sudoku puzzle you will enter via mouse or keyboard. or use the right mouse button to "pencil in" possible numbers for this square. If you prefer the keyboard, simply type the number you select for this square. You can navigate with the mouse or the arrow keys. Using the keyboard does not currently allow to "pencil in" numbers. Get Sudoku: Loads a Sudoku puzzle width a difficulty level as selected in the "Level" field and starts the game. The "Stop watch" is started. Pause / Continue: "Pause" the game until you click "Continue". The "Stop watch" is halted. Check my Solution: Validates your entered numbers. 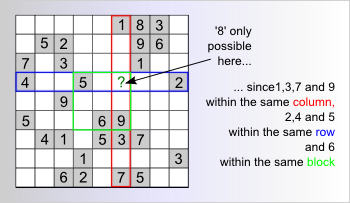 If you solved the Sudoku puzzle correctly, the watch is stopped and if the time you needed to solve the puzzle is within the ten best for the selected level, you will enter the "Best list". Very Easy: Sudoku puzzle can be solved by scanning for "Naked Singles". Easy: Sudoku puzzle can be solved by scanning for "Naked Singles and "Hidden Singles". Moderate: More than 25% but not all of the missing numbers can be found by scanning for "Naked Singles" and "Hidden Singles". Difficult: Less then 25% of the missing numbers can be found by scanning for "Naked Singles" and "Hidden Singles". 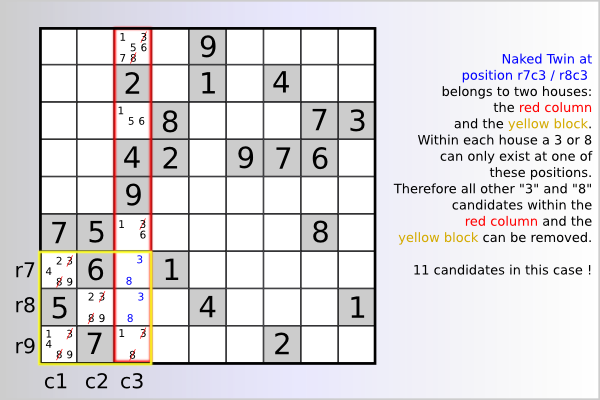 Show Solution: Shows the solution for the Sudoku puzzle. Ends the game and the stopwatch is reset to "zero". Spy Mode: If selected and if you move the cursor over a square to be solved, a small infobox will open and will show you the allowed numbers for this square. You will not get to the best list once you have selected the "Spy Mode" for a game. Number Grid Off: If selected and if you click on a square to be solved, the number grid will not appear. The cursor within the square blinks and waits for input via the keyboard. This feature might be useful for players, who prefer using the numeric keypad. Id: Enter the "Id" of the Sudoku puzzle to be loaded. Load: Loads the Sudoku puzzle width the "Id" entered in the "Id" field and starts the game. The "Stop watch" is started. That feature maybe useful, if you want to replay a game or if you want to challenge the solution time for a specific puzzle as listed in the "Best list". Clear Field: Clears the field and is necessary before you enter a Sudoku puzzle via keyboard or mouse. Set Sudoku: You "fix" the puzzle - and the squares with the given numbers will be shaded in grey color. Solve Sudoku: The solver will display the solution of your Sudoku puzzle. 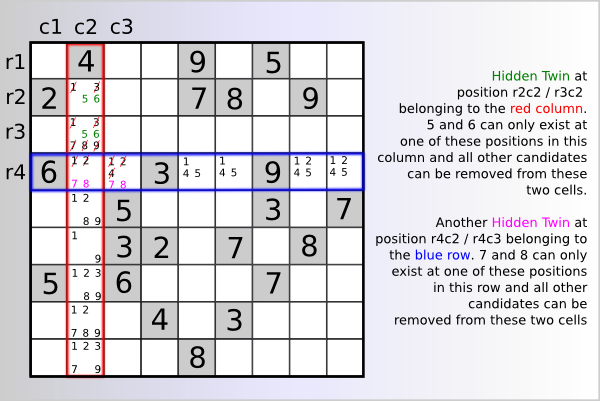 In case there is no solution or if the entered puzzle is not a regular Sudoku, a message will pop up. Save the current generated Sudoku as "pdf" for printout. The pdf document includes the puzzle and the solution as well. Some strategies to solve many Sudokus ! 1) Scan for "Naked Singles"
That are squares, where only one number is possible. Once you have checked all empty fields and if you were able to find some "Naked Singles", then you repeat this process again for the empty squares until the Sudoku is solved or you will not find any "Naked Singles" for the remaining empty squares. 2) Scan for "Hidden Singles"
That are squares, where only one square is possible for a specific number. Look to the example, the possible numbers for the square in the 6st row and 6st column are "1" and "9" - but finally only "9" is allowed in this cell, because the "9" is not allowed in the other empty squares of this row. 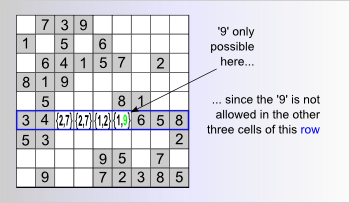 Now it is clear why the "9" is called "hidden" - simply because it is hidden between the other possibilities for this cell, which are excluded if you take the options for the other squares of this row into account. Now, systematically you look for every row, column and block for "Hidden Singles" and you repeat this process until the Sudoku is solved or you will not find any "Hidden Singles" for the remaining empty squares. If you scan for "Naked Singles" solely, you can solve about 30% of the Sudokus with 28 or more given numbers. If you combine scanning for "Naked or Hidden Singles" you will solve even about 65% of the Sudokus with 22 to 31 given numbers. But what to do, if you have combined scanning for "Naked or Hidden Singles" and you end up with some open squares? In that case, you can use methods which reduce (or exclude) the possible numbers for a square, and hopefully you end up with a "Hidden or Naked Single" for a square and you can continue. The exclusion methods are called "Naked Twin" and "Hidden Twin" exclusion rule. 3) Scan for "Naked Twins"
That are pairs of candidates in two cells belonging at least to one house (row,column or block). Each of the pairs candidate can ony exist in the one or the other cell. Consequently those candidates can be removed from all other cells in this house. 3) Scan for "Hidden Twins"
That are pairs of candidates in two cells belonging at least to one house (row,column or block). The pair of candidates is only existing in these two cells. Consequently the other candidates in these two cells can be removed from this two cells in this house.